« Haringey Police Commander Ignores & Buries the criminal activities the police force under his command relishes in. Michael Gove made plenty of headlines when in charge of education in England and several papers look ahead to his first speech as justice secretary. The Daily Telegraph describes it as a “no-holds-barred” intervention, attacking “wasteful” courts and condemning them for adding to the pain of crime victims. Mr Gove “draws on hours of personal observation of court proceedings” to back up comments that “indicate that he intends to tackle the legal system with the same energy he deployed to overhaul schools”, the paper suggests. We ask readers / visitors to consider the obvious we point to, above and we publish below. The need arises to be more than factual and considerate of the realities, which realities the press and the media in general, specifically the editors and programs schedulers, systematically suppress / ignore and thereby with intent fail, abysmally, to concern themselves with such realities as the unavoidable fact that the courts do add to the pain and the agonies of the victims of crime!!! The content of the letter we publish below was submitted to the Ministry of Justice in November 2014 following wilful and arrogant contempt for the criminal activities and the states Mr & Mrs Average, the SHEEPle are subjected to by alleged servants of Parliament’s laws and the victims of the legal circles through the endemic abuse of the courts facilities, generally. For the benefit of any doubtful Thomas and more specifically for the awakening of ANY SHREDS OF HUMANITY within the body of the Intellectual Prostitutes that John Swinton spoke of in the course of his retirement speech (when moving out of the firing line) the time has come for all who access this article / website and the human-rights.org website work / articles by the creator of both websites we publish below a true image of a letter Andrew Yiannides received from the House of Commons, whereby the Leader of the Opposition, Tony Blair MP acknowledged THE CONCERNS of Andrew Yiannides. The letter which the Leader of the Opposition received was part of long ongoing submissions from Andrew Yiannides of the Human Rights Organisation (http://www.human-rights.org) as of the days when he was selected by the Party he represented and was leading in the House of Commons. 1. Acknowledge receipt of this communication, and contents, without fail. 2. Justify and or excuse the mentality of alleged servants of the law and the public who simply failed, carried and carry on failing to execute their public duties with all due diligence and respect to and for the rights of the citizens that are assured in law. I hasten to add, ‘without failure and to all intents and purposes without any discrimination on any grounds whatsoever”. http://www.justiceraped.org/2011/07/bbc/ for good cause and reasons. I was left with no choice but to take such steps after servants of the public and the law simply ignored the serious issues covered in my submissions, to the Deputy Prime Minister who, directed as I qualify above. 4. I attach reprint of my letter of 6th October 2014, (>Reference MoJLAF4F<) which benefited from the same CONTEMPTUOUS MENTALITY of alleged servants of the public and in particular from servants of the Law and Justice. The relevant Department at the Ministry MUST DULY NOTE the inescapable fact that abusers of public facilities, and in particular the legal circles somehow assume the right to steal and plunder funds from the bank accounts of the person who needed and applied for LEGAL AID in order to secure rights assured in law to ALL who seek Justice in the United Kingdom. The fact that the culprits / the offending abusers of the facilities happened to have been persons operating out of the Law Society itself >the Licensing Authority that issues Practice Certificates to solicitors< ought not to be grounds for ANY ALLEGED SERVANT OF THE PUBLIC & THE LAW to indulge as the recipient at the Ministry did, after signing for, accepting and opening the RECORDED SPECIAL DELIVERY LETTER with the attached evidence. I hereby demand that the head of the relevant Department PROCEEDS FORTHWITH TO JUSTIFY & EXPLAIN which rule or facility was used in order for the Law Society to steal and plunder funds from the assisted citizen’s bank account when in fact FIVE SOLICITORS USED THE SAME FACILITY to simply help themselves to funds for nothing in return. 5. I attach also, reprint of my letters of 7th October (>Reference HCOc2014/HBF4F< /file saved as HCHBF4FA<) addressed to the acting Mayor of Haringey Council and I trust that whosoever receives / opens this letter and contents MUST FIRST CONSIDER HIS OR HER PRIMARY DUTY, being the SERVICE OF JUSTICE & THE LAW, does refer and pass on to the relevant Department / officer RESPONSIBLE FOR OVERSEEING the activities and the convenient (as far as I am concerned) failures and contemptuous of the law mentalities alleged public servants >SERVANTS OF THE PUBLIC & THE LAW< gets his or her head round to the one and only issue of relevance, relative to the element of ABUSE OF THE COURTS FACILITIES for CONSTRUCTIVELY ENGINEERED FRAUD on Mr & Mrs Average citizen who reside within the United Kingdom. 6. I attach also reprint of my letter of 16th October (Reference VLC4CTAL) to Mr Vasilis Mavrou. The letter happens to be MOST CLEAR in all aspects covered / referred to, by me, and in particular on the very issue of CONSTRUCTIVE FRAUD as in most cases the abuse of the courts facilities is at the heart of it all. I hasten to qualify and clarify the most simple of logical conclusions one has to arrive at when one considers the blunt contempt for the evidence seen (especially documented evidence such as was the High Court case that opened my eyes over 42 years ago). Reference here to ‘evidence seen yet ignored IN ORDER TO ENTER some alleged judicious judgment warranting appeal, after appeal, after appeal IN ORDER TO PLUNDER & STEAL FUNDS and or convert assets to allegedly legitimate LEGAL COSTS, does COMMAND SERIOUS CONSIDERATIONS on two counts and the choice is simple for the present Minister of Justice, also Parliament itself. (a) Either consider acknowledging the poor quality of alleged servants of Justice and the Law within the lower courts, not that the higher courts are not infested with / by abusers of judicial chair occupancy also, and deal adequately with the problem. (b) Introduce regulations at Ministerial level and or enact specific law to put an end to the ORGANISED CONSTRUCTIVE FRAUD THROUGH ABUSE OF THE COURTS FACILITIES, ongoing for centuries. http://www.human-rights.org/abusers.htm#2010 & I request / demand that whosoever opens and reads this letter DOES REFER THE LETTER & THE ATTACHED DOCUMENTS to the most senior of officers at the right Department within the Ministry and or to the Department of Public Prosecutions, in view of the fact that one is faced with >SERIOUS COMPLAINTS & REPORTS PERTAINING TO ORGANISED FRAUD<. The attached printout of part of the relevant chapter of the research work was commanded of me after the legal circles, the police and abusers of judicial chair occupancy within the Royal Courts of Justice engaged and indulged in the creation and promotion of FALSE INSTRUMENTS LACKING ACCOUNTABILITY by the creators and authors of (judgments). It all started with the creation and promotion of a false document intended to pervert and corrupt Justice. The very document was further falsified after the offending criminals amended and FORGED THE DATE THE FALSE DOCUMENT WAS ENDORSED WITH to begin with. And the offending promoters of the original false document engaged and indulged also in further abuse of trust, because they benefited and benefit from the blind trust of the helpless and the abandoned to the criminals who are in control of the courts and Justice in the United Kingdom, as happens to be the case also, in other allegedly civilised PSEUDOdemocracies. I do not just expect but I DEMAND that JUSTICE BE SERVED as Parliament’s law provides. ENCL. As per text plus letter to the Leader at Haringey Council with the two attachments. Failures by the recklessly irresponsible impostors who ignored every aspect of the submissions and complaints clearly stated and related through the content of the above letter commanded further submissions and challenges as settled and caused to be delivered by SPECIAL RECORDED DELIVERY to Sir Bernard Hogan-Howe the Metropolitan Police Commissioner, the Chief of Police who had / has no clue in the matter of the files that were shreded or lost / disappeared, attached to the investigation / Enquiry in matters that pertain to POLICE CORRUPTION!!! The copy-paste of the explicit letter and the attached supporting documents, as published below were received by the clueless Chief of Police who contemptuously ignored everything as a typical irresponsible / unaccountable person to Mr & Mrs Average, who have taxes imposed on them for the cost of maintaining such servants of Parliament’s Laws and society at large. Copy to the Law Society relative to the plundering of funds as solicitors & others arranged. Refer to the relevant article at www.justiceraped.org relevant to the President of the Law Society. 1. Re: Theft & Misappropriation of Housing Benefit Funds. FRAUD on targeted owners of properties let to the Social Security Benefits supported. Co-operating in the scams Property Managers and Haringey Council staff and officers, up to and including the Chief Executive. Everything with the blessings of Court officers, and Local Authority Councillors. 1. Image of ‘VICTIMS OF CRIME’ as recorded by Haringey police because they had no option but to record the CRIMES (note plural) after I went to my mother’s straight from hospital where the injuries I sustained had to be attended, followed by months of physiotherapy, Sir Bernard. I needed to hear from my sister IF & HOW the Police treated her report of threats to my wellbeing and the damages she witnessed being done to my car in which I was seated with all doors locked. The injuries I sustained included a punctured vein. Everything care of the created, the encouraged and the used for the plans of the creators of the new code of ethics and morals, as imposed on society at large through the schools (education) and other alleged servants of Mr & Mrs Average, who have taxes imposed on them for such services / creations. The encouraged >AS USED< tenants. Mr Nihal WijemunI and his partner’s brother, Nono Congalves also a friend helping for the move. The planned move to destinations unknown three days after a Default Summons >issued out of Edmonton County Court< was served by a process server. At the time of the actual physical assault, my younger sister was on her way (walking) to Hornsey police station because earlier the police failed and declined to attend to the threats by the created, the encouraged and the used for the theft and misappropriation of Social Security funds (Housing Benefit) distributed and channelled through Local GOVERNMENT (Council employees), as the evidence I provide below qualifies and establishes without any room for doubt. 2. Hand written note / letter which I delivered to Nightingale Police station at the corner of Nightingale Road and the High Road, London N22. I went to the Police Station with my sister Mrs Despina Englezakis from mother’s residence where my sister was also residing as mother’s carer. 3. Hand written note relative to proof of delivery of relevant documents to Council Staff and officers constituting proof of the delivery made available also to the Chief Executive who was very much party to the orchestrated Scams. (in the other case I refer to below). The C.E.O, Gurbux Singh, had the audacity to assert to me that he could not he bothered to arrange for a report to the police for an investigation!!! The Council, he declared in a letter, to me, HAD LOST NOTHING. In other words criminal activities from within the confines of the Council were of no concern to an alleged servant of the public, so long as the victims of crime were THIRD & IRRELEVANT PARTIES. Just like Haringey Police, Haringey Council had exhibited over the years contempt for the law, in respect of the neglected and abused children, from Victoria Climbie through to Baby Pete and other children, not forgetting the elderly, the ailing and the targeted vulnerable owners of properties let to the imported NEW TO and FOR THE MORALS & ETHICS instilled / imposed on society by alleged servants of Mr & Mrs Average in an allegedly civilised State, Country, Society, such as the United Kingdom has been turned into / converted by alleged servants of the Law and the Public. 4. Enlarged copy of a delivery slip (number 23) qualifying extensive work and delivery of documented evidence in respect of the signed for delivery of substantial DOCUMENTED EVIDENCE in the Hadjoudj Tahar case. The case included three FALSE DOCUMENTS (letters allegedly sent by the owner of a property from overseas, directing, allegedly, the tenants to ask for the rents (Housing Benefit remittances) to be paid to them, because, allegedly, the owner did not trust the Letting Agency Managers. The introduction of such directions and the references to the existence of such letters was made by the offending Letting Agency Manageress / director. I arranged / demanded for a meeting with the Council staff in order to see and inspect the copies of the letters, allegedly sent to the tenant who passed, allegedly, the three copies to the Council staff who were promoting the existence of such letters. My demand followed denial by the owner who declared to me that he never wrote anything to a non-English speaking North African from Algeria, I think. When I asked of the Letting Agency Manageress to request for copies of the three letters, alleged to have been written by the property owner (after using leg probing, under the table THREE TIMES and she did not do so, I demanded loudly of the Council staff member that copies should be made available to me, there and then, for I was to refer such copies to the owner of the property. The Council member of staff asserted that she could not do so because the Manageress who was there DID NOT ASK FOR COPIES. I pointed out to the manageress the errors of her ways after qualifying to the Council staff member, that I WAS STANDING AND I WAS WALKING IN THE SHOES OF THE RELEVANT PROPERTY OWNER. I then qualified and reminded the letting Agency’s Manageress that she had been asked to keep safe, the Power of Attorney Instrument which the property owner was asked to grant to me, for good reasons. You should note Sir, Bernard that the documents I delivered to Haringey Police were FOR THE ATTENTION OF Dt. Sgt. Webb who was operating out of Wood Green Police Station at the time. However, from information I benefited, later, he was rewarded with a transfer to the police Academy in Hendon for and because of his convenient failures to execute HIS PUBLIC DUTIES which he was expected and BOUND TO EXECUTE as a Metropolitan Police Officer. 5. True print from the Internet of delivery slip No 39, which you will note was signed for, when delivered to Metropolitan Police, Haringey Division on 27th August 1999. You should note that the delivery of more documented evidence attached to the activities of the criminals operating out of Haringey Division, that the documents were intended for DILIGENT USE and considerations by Chief Inspector Ricketts, for and in respect of the above orchestrated scenarios attached to the theft and misappropriation of Housing Benefit funds. I hasten to add that Haringey police enhanced their VERY PRO-ACTIVE parts care of their commitment to and their preference / choice to assist in the organised theft and conversion of Housing Benefit funds to expansion in the realm of CRIMES AGAINST HUMANITY; at all material times nothing but contempt for the LAWS enacted by Parliament, by the elected Representatives of Mr & Mrs Average, who have taxes imposed on them for the maintenance of such persons as alleged servants of the LAW & Justice. 6. True copy of my letter dated 23 August 1999 sent Recorded Delivery to the CHAIR PERSON of the REVIEW BOARD heading the Criminal Injuries Compensation Authority. Reference to the content of the letter SHOULD MAKE IT VERY CLEAR that I was dealing with and addressing the VERY scenarios which members of the criminal cabal operating as alleged officers of the law out of Haringey Police were in fact extending their sphere of activities into other areas of Organised crime, SUCH AS the obstruction of justice AND Parliament’s provisions for victims of Crime. 7. True copy of a document created and submitted by the co-operating in the Housing Benefit scams, AS A USED CREATION OF THE CRIMINAL CABAL operating out of Haringey Council. The document, you will note, is dated 10th March 1999. It relates to and confirms the co-ordination of the parties towards their personal goals and their plans for the owner of the relevant property. (the flat let to the couple Nihal Wijemuni & Christina Congalves); the long ongoing failures to process the Housing Benefit Application, while both parties were blaming one another and THIRD PARTIES for the inconclusive attendance (if any) to and for the ‘right to claim / apply for Housing Benefit. 8. True print from the exhibits / images attached to an affidavit that was duly sworn and filed at court, in respect of the rent account of the used and created fraudsters. Everything arranged by Haringey Council staff and officers, also Haringey Police, in accordance with the new morality and ethics which (alleged) servants of the law impose on Mr & Mrs Average. The document qualifies and clarifies how the claimed balance of the rents owing and unpaid was arrived at. 9. Computer printout from Haringey Council’s records as delivered to the tenant Nihal Wijemuni who submitted it as proof of payments allegedly made to the person he contracted with. Submission of the computer printout relied upon to be factual and true as asserted by the fraudster whose solicitors failed to comply with the demands put on record in the court file care of the REPLY TO DEFENCE (referred to below). In the meantime and all the while no reference to the damages caused to my car and the physical injuries I sustained care of the VERY CONVENIENT POLICE FAILURES TO ACT in any way in accordance with their DUTIES & OBLIGATIONS, under the terms of the retainers for one and all, alleged officers of the law. In the meantime the abusers of public office as alleged servants of the Public relying on such judicial chair occupants as DJ Silverman (Refer to page 13 of the enclosed Notice of Appeal) to ignore and bury such material facts supported by documented evidence when / while seeking to generate income >through theatrical productions in the courts< for the circles from within which he arose to judicial chair occupancy, And the issue of the attempt to DISAPPEAR TO DESTINATIONS UNKNOWN three days after service of the DEFAULT SUMMONS scattered to the four winds, suppressed and buried in the sand where all buried their heads. 10. True print from the first page of the REPLY TO DEFENCE document published on the Internet for good measure because of the threats to life and the boasting by my sister’s husband that he had the police in his pocket; something I could not ignore or overlook when considering the performance of the police as of the attempt to create an insurance claim for alleged water flood from above the hairdressing salon at 178 Weston Park N8. The orchestrated scenario intended to blame my sister and me for the miracle of water flooding from premises with the water supply shut down from the source!!! The challenges and the demand for absolute proof that the alleged payments of the Social Security / Housing Benefit Payments as alleged, had to be substantiated as true and factual, also buried in the sand. Most important and disturbing at the time, however, was the attempt of the Defendants solicitors to secure Legal Aid for the Defendants, presumably on the grounds of the alleged illegal eviction / the alleged lock changes etc. when in fact the encouraged and used fraudsters (New Ethics & Code creations) ignoring and burying the realities such as the damages to my car and the criminal (life threatening) injury I sustained. Everything care of the failures of the police in Haringey to execute their public duties in accordance with the terms of their retainers as alleged officers of the law. 11. Black & White print of the photograph of the state I was rendered into care of three secondary school thugs who were escorted out of Nightingale Road police station and pointed to the bus stop across the road where I was waiting for a bus to go to the Library in order to make some photocopies. The vicious assault with a folded pedal bicycle chain which one of the three school thugs took out of his school satchel, after the three had had their fun punching and hitting me in turn (video recorded activities by the bus equipment) which reality warranted and warrants no additional information from me Sir Bernard. Following on from the above scenario the NEW FAILURES & CONVENIENT OBSTRUCTIONS / IMPOSITIONS Haringey Police engaged in, simply added to the accumulated evil ways of the alleged servants of the law, alleged servants of the public and alleged servants of Justice itself. I need only REQUEST OF YOU & whomsoever you are to appoint to conduct an INVESTIGATION PROPER in and FOR the matters I now bring to your personal attention. I SIMPLY ASK, for AND I DEMAND FROM Borough Commander Victor Olisa (who is heading the Police in Haringey) to PROVIDE YOU WITH ANY OFFICIAL PHOTOGRAPHS THE POLICE EVER BOTHERED WITH and for any proof of prosecutions proper where / when (If ever) I was called upon to give evidence and any photographs were presented to the Magistrates or Crown Court Jury. I expect also to benefit from any justifiable reasons and explanations for the failures of Haringey Police to provide me with a copy of the video recording of the punches and the vicious assault with the folded pedal bicycle chain. 12. True print of the image of my letter to Mr Bernie Ryan of the Legal Department maintained by Haringey Council, the beehive of the criminal cabal operating as licensed criminals who apparently are not subject to the restraints of Parliament’s Laws. Attached to the 2pages long letter was a print of my 5 pages long letter to Chief Superintendent (error on my part at the time of writing the letter). The content of the letter to Commander Victor Olisa was and remains clear enough, just as the printed Big Story material on the last (back sheet) of the letter-document. My FIVE pages long letter to Commander Victor Olisa was VERY CLEAR. The letter was intended to jolt him out of the lethargy and or trance he has been relishing in for far too long. Instead the abusers of public office moved on to new pastures, following new creations as indulged by third parties. Moving on to the new criminal in intent activities, the ever present assertions by Haringey Police that ALL IS LEGAL; the police thus shown to be endorsing criminal in intent activities and the objectives of the criminal cabal, such as breaking in (physical damages to property), entering without the property owner’s consent (illegal entry), proclaiming the activities were/are within the law and within some alleged rights which illiterates in law set / go about asserting and promoting anything and everything as legal in furtherance of THE PLANS OF THE CRIMINAL CABAL operating out of Haringey Council and Haringey Police. Everything of course, as planned and orchestrated for the targeted owner of the broken into property. To make matters worse ‘the police carried on asserting that NO WRONG WAS DONE; when the criminal also indulged in arrogant theft and removal of all properties that could be taken away, from the broken into flat, yet again Haringey POLICE constables and OFFICERS ASSERTING & DECLARING THAT All & everything was LEGAL as far as they (one and all) were concerned, of course. ADDING INSULT TO THE EXTENSIVE INJURIES = financial, physical and mental (torture and agony) came along the co-operation of one of the Letting Agency owners / Managers, Mr Vasilis Mavrou and his staff. The creation of New States, as imposed comprised of alleged Council Tax Liabilities (care of Mr Vasilis Mavrou and his staff who populated the property with many a tenant as arranged between him, his staff and my elder sister Maroulla Joannides Antoniades who acted as if outright owner proper of the part of a property known as 16 and 16a Woodside Road, Wood Green, London N22. Notwithstanding the fact that the Tenancies created were as arranged between Vasilis Mavrou and Mrs Maroulla Joannides Antoniades. nonetheless the arrogant liberty-takers arranged for Council Tax Demands to be submitted to my younger sister Mrs Despina Englezakis. Thereafter, and since, all staff and officers, members of the criminal cabal operating out of Haringey Council failed and carry on failing to attend to the errors of their ways, as instigated by Vasilis Mavrou and his staff. 14. The Big Story document which I created and circulated to friends and contacts on the Internet commands consideration, for it relates to such persons as allegedly honourable officers of the law and Justice, such as I was the victim of, way back in 1972-1976. (Refer to the last Document please : “Who, IF ANY, Cares”? It was printed from the interfered website JusticeRaped’ as it was published on the Internet until some agent of the powers that be got busy last week, for obvious reasons. 15. 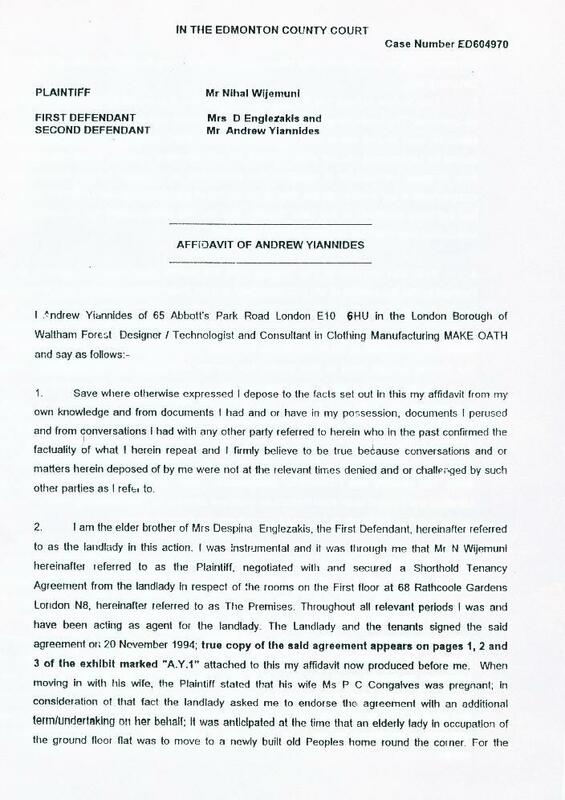 My letter of 3rd March 2015 to Vasilis Mavrou of Varosi Lettings is clear enough as to his past and the present parts and contributions FOR THE CRIMINAL IN INTENT CREATED & CONCOCTED STATES which abusers of public facilities from within Haringey Council engaged and indulged in, while of the erroneous belief that they can rely on abusers of the courts facilities who simply carry on as if their prescribed independence from interference in the execution of their public >DUTIES & OBLIGATIONS< TO SERVE THE PUBLIC, AND JUSTICE AS PARLIAMENT’S LAW PROVIDES, can be extended to and or misrepresented AS IF INDEPENDENCE OF and from the RESTRAINTS OF the LAW ITSELF. The demand that Mr Mavrou should make good the CRIMINALLY INSTIGATED DEMANDS FOR COUNCIL TAX from the wrong person was and remains VERY CLEAR. Nonetheless the recklessly irresponsible criminal has yet again to respond in any way, and he has not made good the errors of his ways<. He elected to ignore the demands as submitted to him and care of his inexcusable failures and reckless creation of FALSE RECORDS with criminal intent has been causing damages in tandem with the criminal cabal operating out of Haringey Council as in the area of Housing Benefit theft and misappropriation such as I relate to / report to you personally. My concerns at this point in time relate to the long ongoing constructively engineered frauds as orchestrated and directed at my younger sister and indirectly at my person >because of her support for my research first noted when the telephone service / was interfered with when Barclays Bank was grubbing back the Direct Debit charges as soon as each month’s payment was made, for no other apparent reason than to bring about the cessation of the telephone and broadband service, most relevant to the research and my work, published on the Internet. My resilience and commitment to expose all abusers of the trust of Mr & Mrs Average< has been and is causing many an abuser of public office and public facilities more than to reflect and put an end to the unacceptable practices I first got to know of and experienced the life threatening health problems that developed as the results of the stresses that created a very bad case of stomach ulcers. 16. My commitment, and resilience, however, are encouraged by the support my work has been and is benefiting from, and I request Sir Bernard, that you do consider the content of the article I authored in May 2014 which I printed from the Internet as a precaution and because of the need to post the material in printed form. I am hopeful that, unlike Sir Robert Mark, QPM, you will prove to be supportive, not shy away or ignore the unacceptable practices and most concerned as I have been for over 43 years, ever since I was subjected to the criminal in intent abuse of the courts facilities, as organised and arranged by my own solicitor, an old school friend from the days we were both students at The English School, in Cyprus where we were both born. 17. My letter of 9th March 2007 relative to the assault I suffered when travelling in the bus 329 which the police treated as a non-event, and never arranged for any official photographs to be taken; also failed and declined my requests for a copy of the video the police secured delivery of from the Arriva bus Company and never passed on a copy just as the police failed to pass on any information to the Victims Support group operating out of the London Borough of Haringey. In other words nothing but the usual through contempt, contempt, contempt for Parliament’s provisions for victims of crime!!! . 18. The stated realities as presented through these submissions from me, when one refers to the Council Tax Demand as Changed and submitted to Mrs Despina Englezakis clearly points to recklessness, also, if not wilful and criminal in intent imposed states evinced by the relentless improprieties in which Haringey Council Staff and employees engaged and indulged in as of the days when my younger sister Despina took over the management of the two properties in Hornsey from her husband who did not just neglect the two properties in Hornsey, North London, but he neglected also the needs of their three children, to the point when their younger daughter, Rita, was caused to end it all and took her own life, when barely 23 years old. ENCL. As covered in the text and paragraph by paragraph numbered. PS. I am the person who video recorded your presentation to the interested and the concerned residents of Hackney & Haringey. At the time an officer who was seated behind me on hearing from me that I wished to deliver some documents which I had taken along, commanding your personal attention, he offered to deliver them to you by implying that he was part of the team from your office. His email address he wrote down for me proved to have been ‘conveniently erratic. When enquiring of the possibility of tracing him I discovered that he was actually operating out the Haringey Division. Hence the reason why he never responded to my emails, after I secured the correct email address for officer BARDETTI. Should you wish or need a copy of the video I made of the presentation feel free to contact me. I conclude by drawing attention to the words from / by Isokratis, the very words submitted to all who were receiving emails from me over the years. “… virtue is not advanced by written laws but by the habits of every-day life; for the majority of men tend to assimilate the manners and morals amid which they have been reared“. Virtually all of what you articulate happens to be astonishingly appropriate and it makes me wonder the reason why I hadn’t looked at this with this light previously. Your article truly did turn the light on for me as far as this subject goes. Nevertheless there is actually just one factor I am not really too cozy with so whilst I make an effort to reconcile that with the actual core idea of the issue, let me see what the rest of your readers have to say.Very well done. 1. Created false instruments through which the abusers declared the creator’s sister bankrupt, allegedly because she was insolvent. Please access and follow the next phase of EXPOSURES that will follow with the demand for the INDICTMENT OF THE SOLICITORS, for THE POLICE and the judges who can be named / traced through the records maintained by the United Kingdom government as of 1970 when I HAD NO OPTION & OTHER AVENUE but to instigate High Court proceedings against some fraudsters who engaged in fraudulent misrepresentation in the course of conducting business with me. Why not check and select a theme from the WordPress software themes which is precisely what is used here? Most certainly I like your web-site but you need to test the spelling on several of your posts. surely come again and again. It’s been amazing getting to see and read this web site. Reading the material at this page and getting to know of the creator’s views on such matters and the specific topic makes me add that I am also keen to get the mist of your know-how. Hello! I’ve been reading your articles at this site for a long time now and I finally got the bravery to go ahead and give you a shout out from New Caney Tx! Some request and offer at the same time!!! At the same time submit YOUR COMMENT TO THE ARTICLE YOU PURPORTEDLY did read and study the implications covered by the very article IF YOU did take time to look into / research the foundations of the very article and the SUBJECT MATTER. those studying the important suggestions found on your web blog. We appreciate your sharing the important information I got from your web page. material is rattling good :D.
talking and writing about on the internet. You certainly realize how to bring a problem to light and point to the importance of it. A lot more people should look at this and understand this side oof the story. I am really surprised you aren’t more popular because you surely have the gift. my Google account. I look forward to new updates and I will talk about this website with my Facebook group. Wonderful article! We are linkingg to this particularly great content on our site. actually good, all be capable of easily understand it, Thanks a lot. Outstanding article. I’m verifying regularly this blog exactly what fascinated! Particularly beneficial data specially the continue component 🙂 My partner and i keep these kinds of facts a good deal. I was seeking this kind of information for some time. Thanks as well as all the best ..
Howdy do you mind letting me know which hosting company you’re using? loads a great deal faster then most. Can you recommend an effective internet hosting provider with a reasonable price? Thanks for the visit and contribution, friend. The overall consideration you must address is not the service but the content, not the writing itself but the othe content such as images for instance. The simpler the content the better without clattering which in itself removes interest in the subject matter such as the very serious issues we address and EXPOSE with the supporting evidence when called for. to bookmark it and return to read more of your own helpful info. Thanks a lot for your post. I am going to certainly comeback. I feel this is certainly one of many most important information in my opinion. And i’m glad reading your article. really like what you might be saying and the way in which in which you happen to be saying it. You are making it entertaining and you still look after to stay it smart. I can’t wait to learn a lot more on your part. This really is really a wonderful site. Many the alleged victim-challengers who, over the years, sought assistance and offered co-operation BUT ALL established early on what the intentions and aims of each one were!!!! Simply put, ‘to secure assistance and benefit from guidance as to HOW TO CHALLENGE and proceed with their contributions towards the exposures warranted and MOST RELEVANT towards MY GOAL which was to put an end to the organised CONSTRUCTIVELY ENGINEERED FRAUD intended to lead to the REWARDS UNDER & SUBJECT TO THE CONDITIONS put to the successful who, somehow, (hence the need to seek assistance and guidance) managed to end up submitting their ‘stated case’ to the European Court of / FOR human rights. Part of the research work and study of the charlatans, the dreamers and the fraudsters who made it their business and priority to obstruct me provided me with more than enough evidence about THEIR REAL PLANS AND INTENTIONS AS PRODUCTS OF THE SOCIETY, THE STATE that reared and created each and every single one. ACCESS and read the letter from the solicitor Anton operating out of the unaccountable Republic of Haringey. The very solicitor was acting for one Johan Michael Richard Foenander, a () Litigants In Person Society (LIPS) member whose case had been lodged / submitted to the European Court of / FOR Human rights. The very solicitor declined an offer from an offending solicitor who had taken Mr Foenander for a ride (so to speak, ‘as a typical solicitor, licensed by the Law Society’). Hence the offer WHICH OFFER Anton’s declined stating in the same letter that the client’s case at the ECoHR was ‘almost concluded’. Only morons and idiots cannot work out the duplicitous context of such a letter from Antons. The very solicitor was party to the RAMPANT, as ORGANISED, HOUSING BENEFIT FRAUD for which my sister & myself, eventually, were obliged to institute legal proceedings out of Edmonton County Court, the beehive of the criminal activities (>the HOUSING BENEFIT FUNDS THEFT & MISAPPROPRIATION<) as the case instigated by my sister and me, was and thereat, ESTABLISHED THE PARTS OF ALLEGED JUDICIOUS servants of Parliament's Law. One and all simply engaged and indulged to their heart's delight as endorsers of it all. Everything, of course, care of the police and the alleged representatives of the SHEEPle, of the sucker-serfs who have taxes imposed on them for the maintenance of criminals as alleged servants of the public and Parliament's Law!!!!!!!!!!!! WAKE UP SUCKER-SERFS. Andrew Yiannides London - United Kingdom, the mother of all allegedly civilised PSEUDOdemocracies, resting anhd founded ALLEGEDLY on principles of LAW..... and orders from and by the dco9rrupters of Society. Visitors / readers of the realities covered in our pages, especially the above article, should pass on the URL / where the realities are covered.